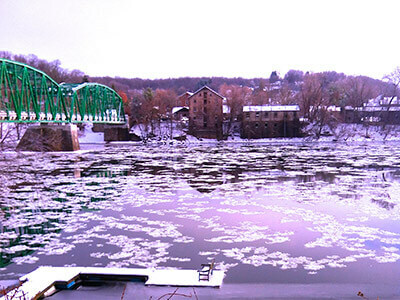 If you are looking for the top things to do in Bucks County, PA look no further. Each changing season offers a wealth of natural beauty and unique events for visitors or honeymooners to enjoy. Start with a visit to one of our New Hope wineries, select a restaurant from our top 10 list, or try an activity below for the changing seasons. 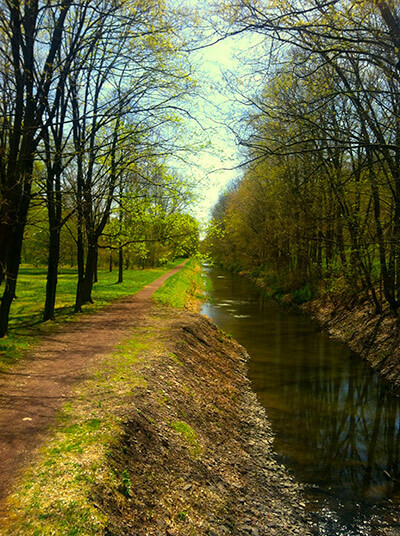 Enjoy a leisurely bike ride or hike along the canal path, just steps from the inn. The spring blossoms reflecting in the water and the scent of honeysuckle will refresh the soul. Berry Picking at one of many local farms (Try Trauger’s Farm Market) “One for the basket and one for the belly” makes for a delicious afternoon! Make your own Rock Concert at Ringing Rocks Park. Be sure to bring your hammer! Take a Bucks County Wine Tour. Satisfy your inner foodie with a Bucks County Food Tour featuring fresh artisanal food. A Sunset Cocktail Cruise on the Delaware, our favorite time to be on the river. 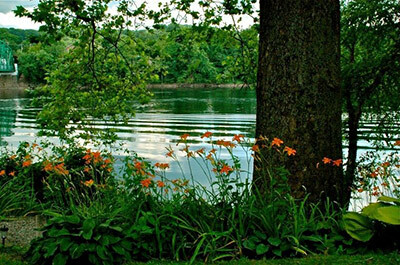 Sit on our private dock and dip your toes, or if it is really hot, dive on in, the water is refreshing. Pick a beautiful fresh bouquet of flowers, fruits or veggies. Or if you prefer, just stop by one many local farm stands. Try Solebury Orchards, the freshest and finest. Spend the afternoon in Doylestown, PA exploring the latest exhibits, local art and history: Michener Art Musuem, Mercer Museum & Fonthill Castle are all within in walking distance of each other. 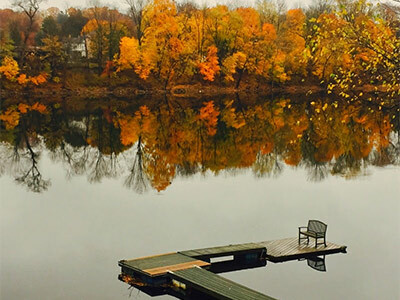 Enjoy a trail ride around Lake Nockamixon – the foilage reflecting in the lake is stunning. Engage in a driving tour of the eleven covered bridges in the area, and observe the changing leaves. Hiking at High Rocks and basking in the glorious scenery. Apple picking in the cool Autumn air at Philips Farm or other area orchards. Hop aboard the New Hope & Ivyland Railroad for an afternoon of leaf-peeping the Bucks County Countryside. 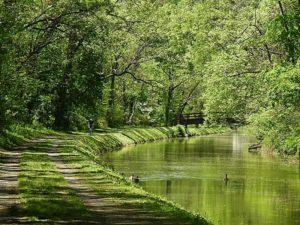 Rent a bike, order a picnic and take in the views as you ride along the canal tow path, just steps from our front door. A romantic carriage ride through freshly fallen snow. Enjoy a wonderful fireside dinner at a local fine dining establishment, better yet – skip the drive and add our candlelight dining package to enjoy a private dinner fireside at the inn. Visit the ArtYard in Frenchtown, NJ and enjoy the latest exhibits in this innovative space as you explore the “transformational power of art”. Breakfast in bed in one our fireplace rooms is sure to warm the heart. Driving along River Road on a winter day.